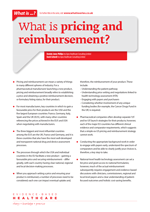 What is pricing and reimbursement? | Whatis Series...? The processes through which the USA and individual countries in the EU facilitate a new product –gaining a favourable price and securing reimbursement – differ greatly, with each country having clear national, regional and local decision-making processes.